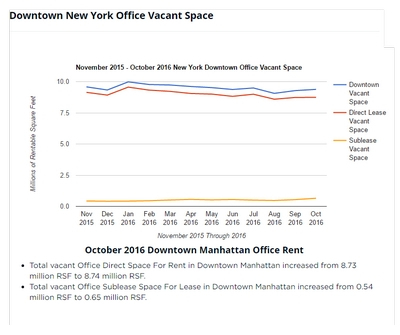 Manhattan’s office-leasing market started strong with tenants signing 4.5 million square feet of leases in January, an increase around 70% from last year. 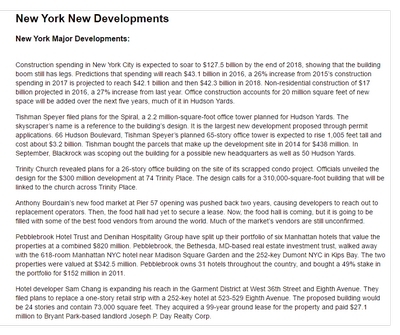 Sixth Avenue had four of the top five deals in January. 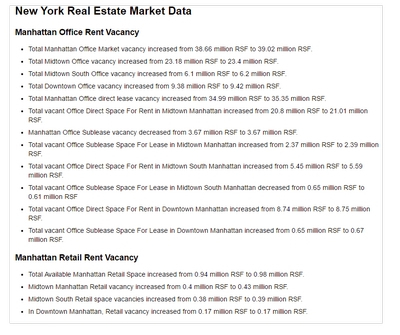 Manhattan absorption was positive at 440,000 square feet. 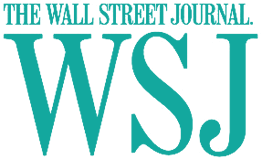 The market’s average asking rent climbed to $73.40 per square foot. 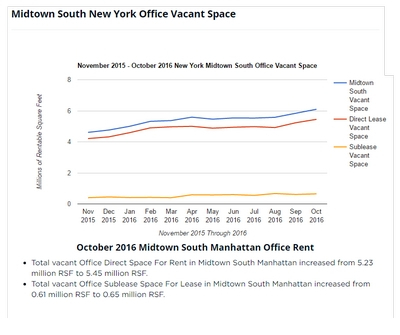 Manhattan ended 2016 with more than 33 million square feet of leasing activity, a 5.5% increase over 2015 but absorption turned negative for the first time since 2009, as activity failed to keep up with additional new supply. 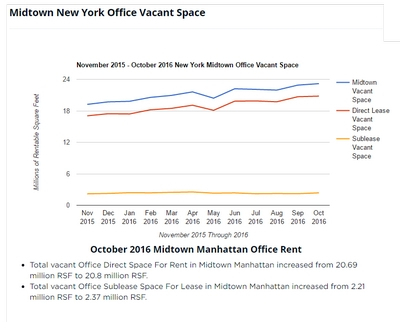 Office landlords are going to have a harder time pushing rents, as new supply comes online and job growth slows. Developers are continuing to build, in part, because their projects are already underway. 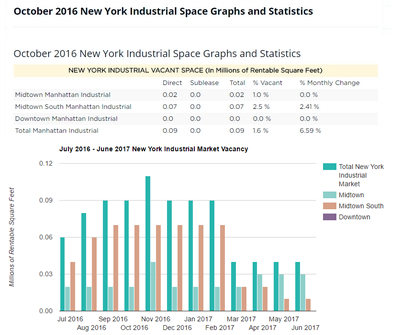 The Chelsea submarket was active with 691,945 square foot leased in the fourth quarter with average asking rents at $71.12 per square foot. 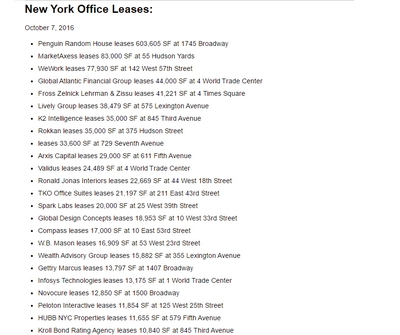 The New York State Attorney General’s 342,000-square-foot lease at 28 Liberty was the largest new deal downtown, excluding renewals since late 2014. 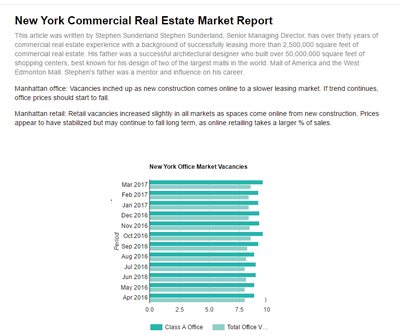 The Lower Manhattan office market average asking rents rose above $60 per square foot for the first time, led by above-average-pricing for space at 3 World Trade Center and 101 Franklin Street. 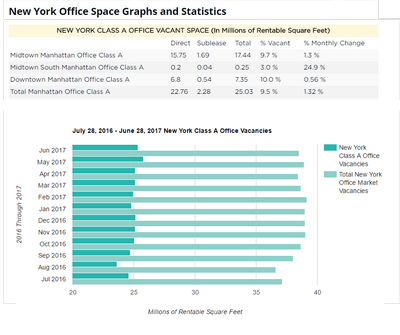 Total sales volume for office properties in New York exceeded $21 billion in 2016, a 7% decline from 2015, while price per square foot grew 7% to $1,347. 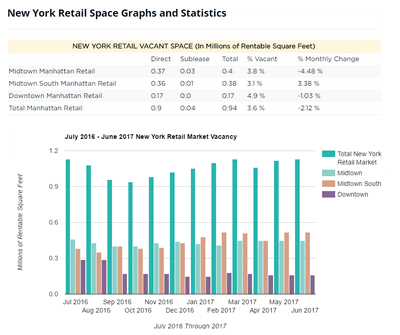 Manhattan retail landlords are dropping asking rents along Third Avenue as much as 44%. 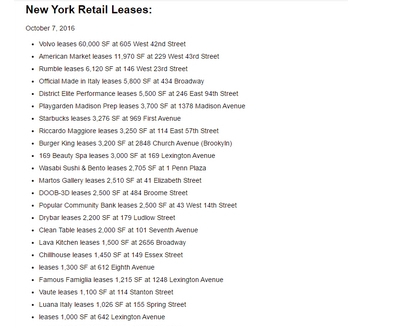 With the national chains continuing to close stores and banks, needing smaller footprints will continue to suppress demand and increase supply. Thor at 1251 Third Avenue reduced the asking price from $1.8 million to $1 million a year to get a retail tenant. 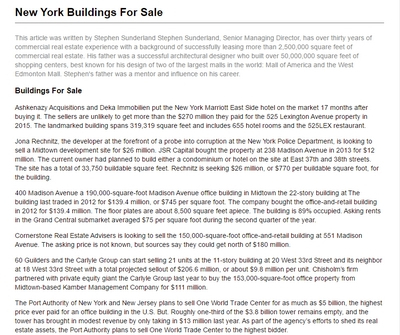 There are several large vacancies along Third Avenue, especially between 59th and 79th streets.